I don’t just love to eat turkey on Thanksgiving. I love to decorate with them too. 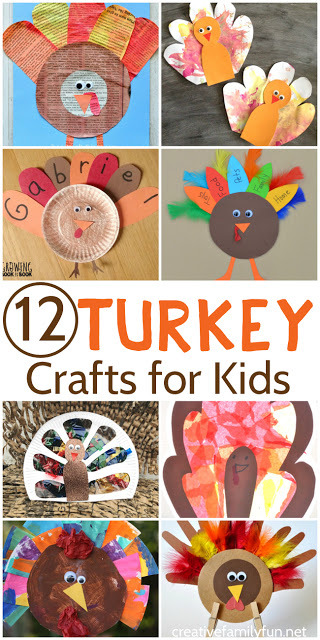 Since my favorite things to decorate with are kid-made, I’ve rounded up a batch of fun turkey crafts for Thanksgiving. Take a look. Which one should my girls and I make for this year? They’re all so colorful and so much fun. I know each and every one of them would be so much fun to make. 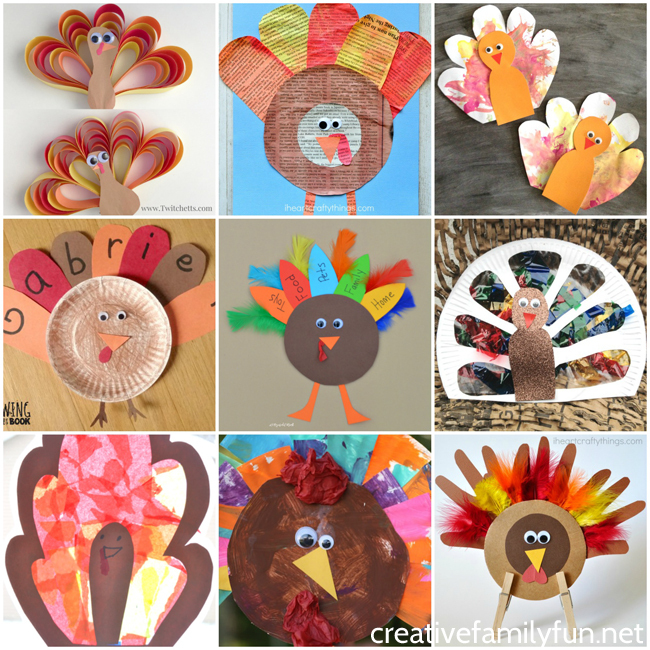 Which one of these turkey crafts is your favorite? 1. This Egg Carton Turkey from Red Ted Art is also a treat holder. 2. Use fall leaves to make this pretty Leaf Turkey at Crafty Morning. 3. Turn a paper plate into a beautiful Stained Glass Turkey at Crafts on Sea. 4. Use folded paper feathers to make this fun Paper Turkey Craft from The Inspired Treehouse. 5. Transform a paper plate into this colorful Painted Paper Plate Turkey from Happy Hooligans. 6. Decorate your windows with our pretty Turkey Suncatchers. 7. Grab some newspaper from the recycling bin to make this Painted Newspaper Turkey Craft from I Heart Crafty Things. 8. Reflect on all the things you are thankful for while making this Thankful Turkey from The Resourceful Mama. 9. Try a new twist on the classic hand print turkey with this fun Turkey Craft from I Heart Crafty Things. 10. Play a fun name activity that results in a cute craft with this Feather Letter Turkey at Growing Book by Book. 11. These cool Construction Paper Turkeys from Twitchetts would also make a great Thanksgiving centerpiece. 12. Paint with feathers and then turn your masterpiece into these fun Feather Painted Turkeys from Crafts on Sea. I still don’t know which of these turkey crafts we should make this year. Maybe we’ll have to try all twelve!